Not sure if I have posted this before, but in case I haven’t…..
A 1940s vocational film on woodworking. Back when the world was a simpler place, and you didn’t need a degree to sell McDonalds chips. Want to win some router bits? Toolstoday.com are holding a quick woodworking comp through their Facebook page. If you follow this link, you will come across the page, and where you can submit the photo of your project. The winner gets $US250 to spend on their website. Had a few smaller visitors to the shed over Easter. My daughter and her cousins, who were quite intrigued by the place. But what better way than to show them, (and better yet), get them involved (at least as far as possible)? So we decided to make some toy vehicles, using the same basic concept as I wrote about in a recent ManSpace magazine (and have written about here as well). A length of Tasmanian oak for the vehicle bodies, and a board of the same to cut out the wheels. Each of the kids helped choose and design the vehicles, sketched out along the length of timber. This was then cut out on the bandsaw, sanded on the spindle and disk sanders, holes drilled (by the kids) on the drill press for windows, and edges rounded over using the corner rounding 3D bit from Toolstoday.com. More on that bit another time, but just to say, it is perfect for toy making. Wheels were cut out using Carbitool wheel cutting bits, holes drilled for axles, exhausts, headlights etc. Each then worked to glue wheels to axles, dowel for exhaust pipes and siren lights as appropriate. From left to right, we have a double-decker bus, Formula 1 car, police car and jeep. Think the kids got a good amount out of it – sure hope they did! Later, I gave the vehicles a bit more detail, using a branding iron, and pyrography pen to add details like front grills, racing stripes etc. It is really rewarding working with a younger generation in the workshop, so long as you have proper supervision, safety equipment (that they love wearing), and tasks that are applicable to their skill level. If you have the possibility of the occasional visitor, it is really worth having some projects up your sleeve, ready to go (and child-sized PPE). This may be no more than the concept and a mental plan, but it would be even better if you had a drawn-up plan, templates, even some precut material ready to go. Even a small amount of involvement in a project sows seeds that can influence a child across their lifetime. Forgot to mention- there was one casualty. The drill press decided to smoke itself (literally, but very mildly), and lost about 90% of its already limited power. I sure hope the DVR drill press is not too far away. On one hand, the shed is regarded as a dangerous place for the unwary, and the inexperienced. Not so much inexperience in woodworking, but inexperience in life. On the other hand, being able to enjoy woodworking with you child (or grandchild) can be an immensely rewarding experience, for both of you. I would normally be very reluctant to have an inexperienced hand using a tablesaw, yet while making some shelving for some kitchen cupboards, Jess (my 7 year old) wanted to help, and not just help by standing around watching. Having a SawStop meant the answer to that question was not “No” or even a reluctant “Maybe”. It was a definite “Yes, of course”. Now she didn’t get to cut the board unsupervised or unattended – I’m not that confident! Tablesaws can do damage in plenty of other ways, particularly hurling things at you at 250km/hr! By setting up a featherboard, having the guard in place, and standing beside her, she was able to feed boards through the blade, and not give me absolute conniptions. Even on a regular saw, she would have been safe, but knowing that there is also the SawStop technology between her and a disaster really enhances the experience of woodworking with your offspring. And it is another activity for her to add to the crazy quilt that is life’s experiences. SawStop really makes a huge difference in relieving some of the stress that can surround the workshop. Yesterday got a bit busier than I was hoping, so last night I worked on the computer for a while to fine-tune a couple of vector designs ready for the CNC machine. So this morning, I sent the files across to the PC laptop I am using to drive the CNC Shark Pro to get it working. I had it set to pretty light passes – perhaps a bit slow, but off it went. And while I was ‘woodworking’, I also managed to do the dishes, cook two cakes with my daughter for her Nana’s birthday, shop for dinner, cook dinner (slow cooker), force feed the cat (long story), and respond to some comments on the blog. And all the while, the constant buzz of a noisy little router buzzing in the background. It’s woodworking Jim, but not as we know it. 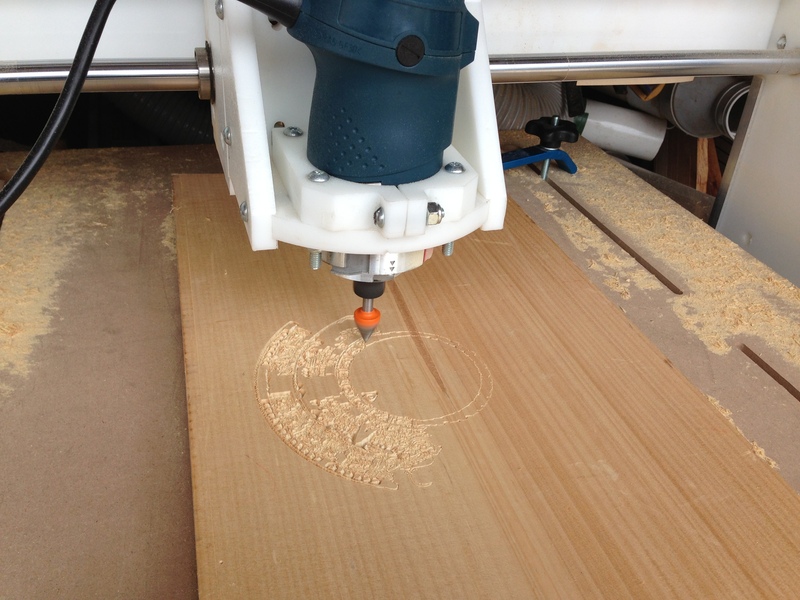 CNC machining is quite incredible, and opens up all sorts of possibilities. Not only in what I have been playing with so far in carving and patterns (wooden signs seems to attract a lot of buyers), but also in part fabrication, and repeatability. 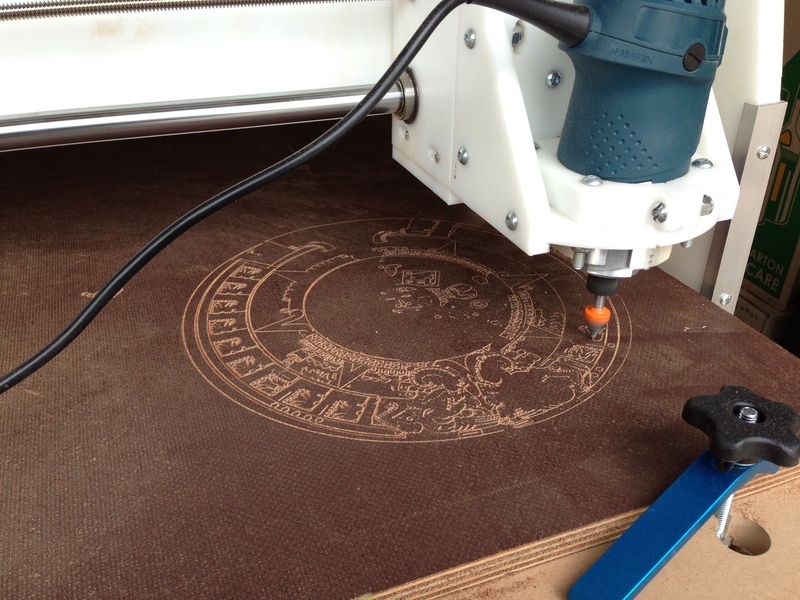 A CNC can easily become a cottage industry (as many have discovered). If I had one of my own, I’d potentially see how far I could head down that track myself, but not to the detriment of my actual woodworking. This is fun, and the results are mindblowing, but it isn’t an end unto itself for me. I would see it being an incredible tool to supplement the others in the workshop without question. 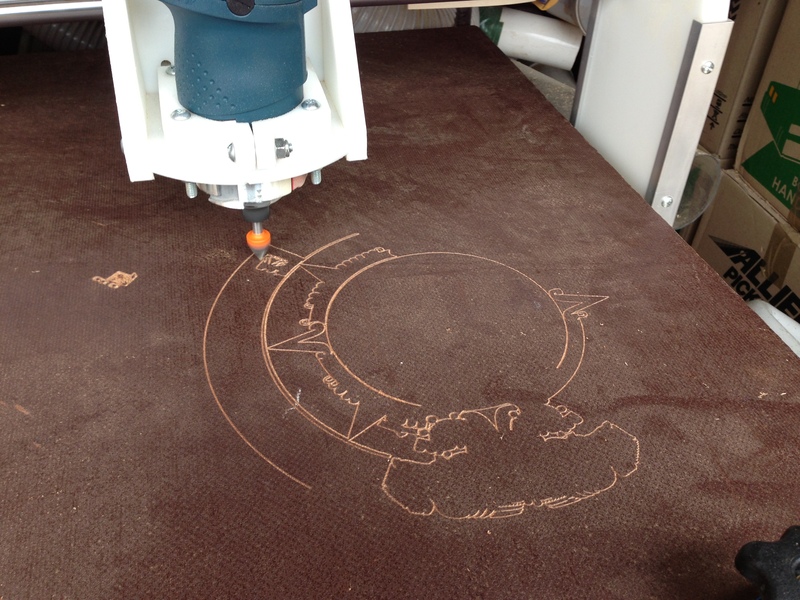 Some things can be done easier on a CNC machine, some thing can be done on the CNC that I have no experience in at all, yet it allows me the ability to incorporate them into my projects anyway. 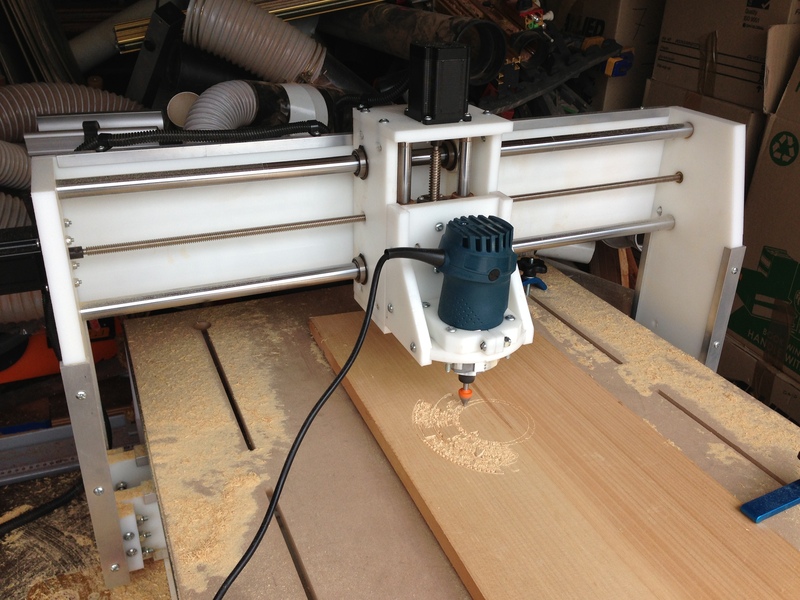 I had the machine running much of the day on a few projects – swear I can still hear the router! 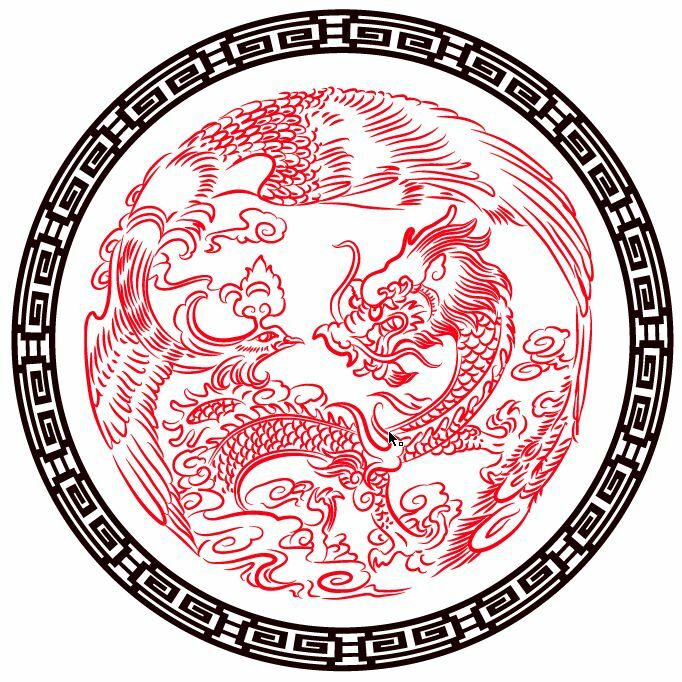 The first came out pretty well – the resulting dragon. Photo’s a bit blurry, but you can see it came out pretty well. The material is a laminate of a masonite-like material on MDF. Makes the designs pop! My initial reason for using it was the flatness – carving intricate designs needs a very flat surface, otherwise detail can easily be lost. 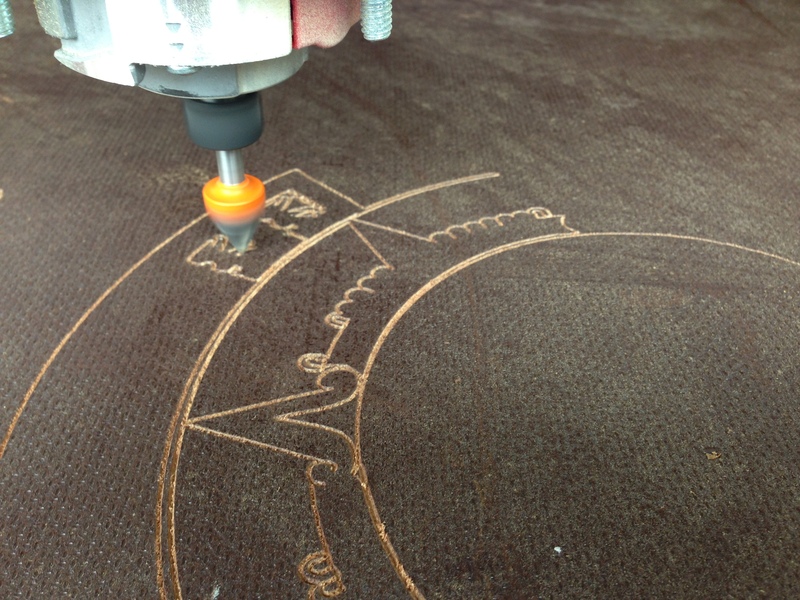 There were some replication errors – I don’t know enough about CNC to know if the machine deserves the blame, the controlling software, or the V Carve program. Not too big a deal, but I wouldn’t want to see too many errors creep in if I was looking at selling items. Onto the second program, and this one was a serious workout. 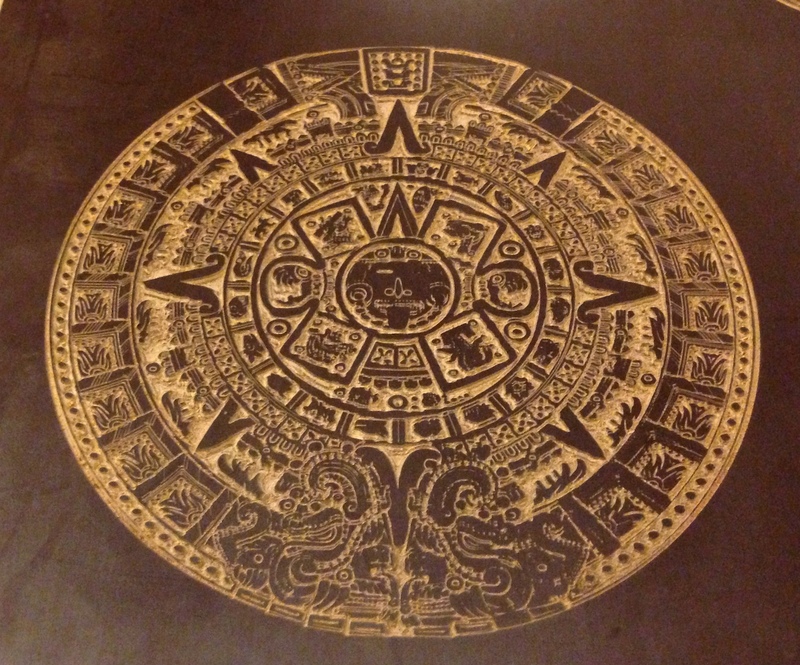 The Mayan calendar. Took about 4 hours. Not the best material for such an intricate design, nor the best cutter. It came out pretty well considering, but the combination of cutter and machine, and it pushed it a little beyond its limit. Probably needed to be done in stages, as it developed a bit of a calibration issue as time went on. There are a number of lines missing, as the CNC shark seemed to forget exactly how low zero was on the Z axis. It really needed a method to self-recalibrate during the run. I suspect that a more recent model would have produced a better result (and the high definition CNC Shark even better again). Carbatec now have a newer model (and there was also a high def version – not listed on their website though). Again, such an intricate design being done in 2-3 parts would have helped in this situation, rather than one long (400,000 steps) run. A better cutter wouldn’t have helped the creep in the zero point, but could have produced a sharper image. I will go into that in more detail soon, but just as a heads-up, the In-groove set from Toolstoday.com will make a real difference to the finish. So what am I going to try next? Not sure yet, but looking forward to it never-the-less! 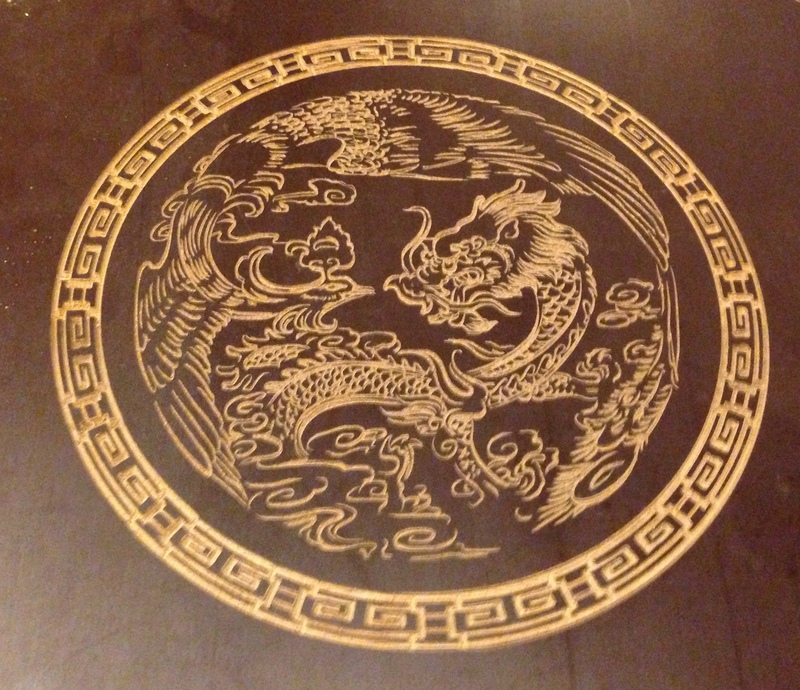 Could be 3d carving, could be cutting out parts – I haven’t begun to find out all the ways the machine can be used. Given we are still here, guess that yet another “End of Days” has quietly slipped on past. 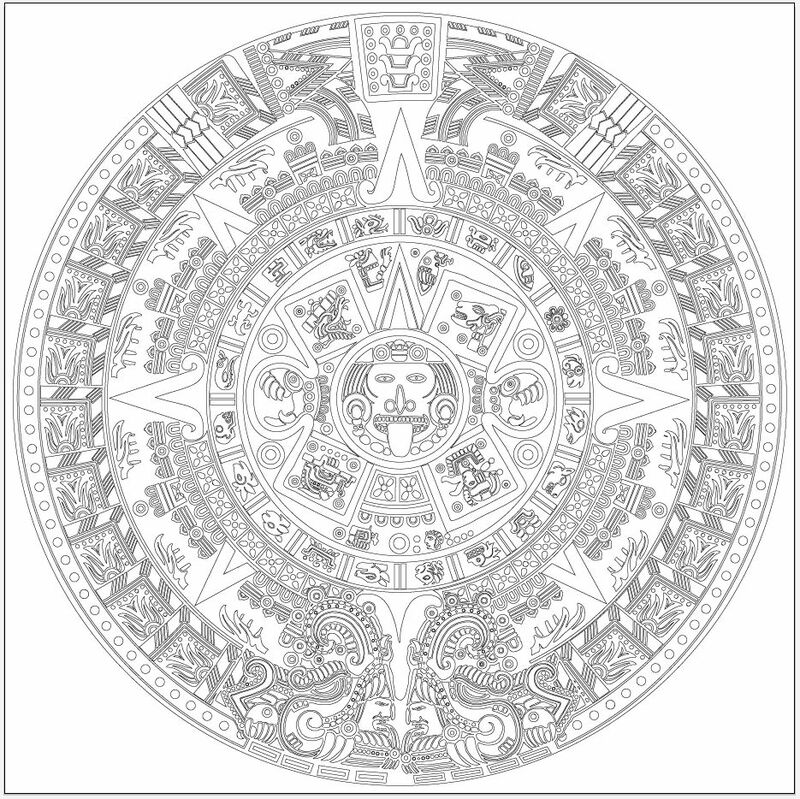 However, the Mayan calendar (or is it Aztec?) is still one of the challenging images that are sent to CNC machines all over! 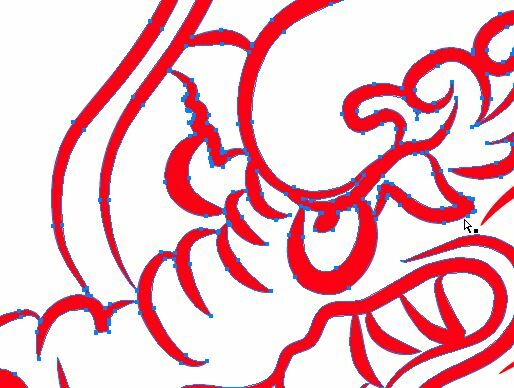 It is quite a challenge for a CNC machine – results in around 1/2 a million lines of G Code to produce all the required cuts. I started off cutting it into pine, but the initial size chosen (200x200mm), the depth of cut and the crapiata used, the results were not worth pursuing, so I cancelled it after about 45 minutes (so at least I could get a good idea how it could look). 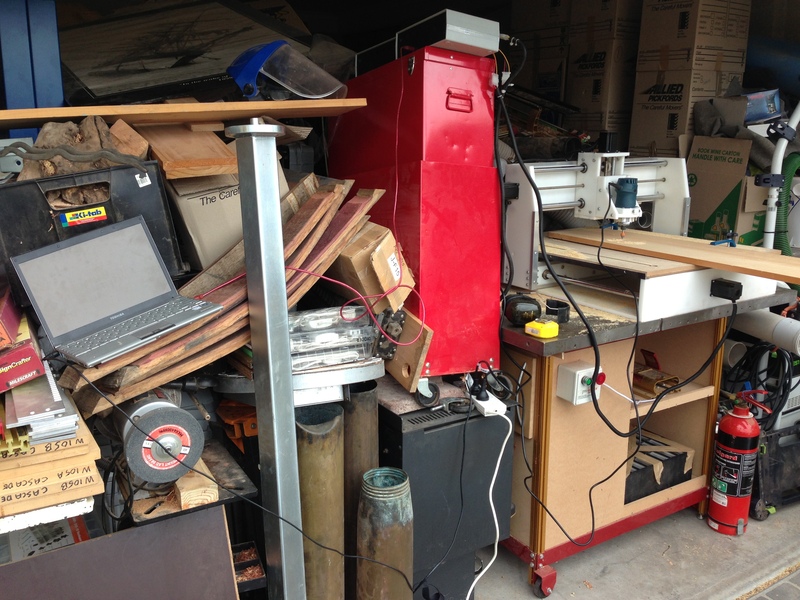 Given how packed the garage is waiting for the new shed, working on a CNC machine is almost the only way I can actually manage any woodworking at all! Note the precarious location for the laptop, so it is somewhat out of dust range from the router. I then decided to find something more suitable, and this laminated electrical board was eminently suitable, given the lower layer is a significantly contrasting colour, so the pattern shows up exceptionally well. Again, this was only a test cut on the underside – this was scaled to 300×300, and would have taken 4 hours to complete. I stopped it after an hour, again as it was only a test, and a couple of settings I chose were causing some issues. The other side of the board is a shiny surface, and should look pretty spectacular. However, I plan to make it near the limit of size of the machine (a 580×580 calendar). I didn’t start it today as I wanted to get a better idea of the settings before getting it underway. It will also take 14 hours(!! ), so I need to get some noise control in place before trying it on. I might drop it back to 500×500, which will probably be closer to a 12 hour machining.